Big News on Used Cars! 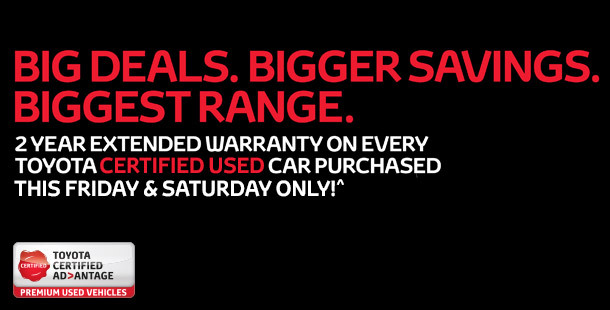 This Friday and Saturday get BIG deals and BIGGER savings across the BIGGEST range of Toyota Certified Used Cars in South Australia. Take advantage of our FREE 2 Year Extended Warranty on every purchase^. Try negotiating that with a private seller! The Toyota Certified Used Cars program is proof of our commitment to constant improvement and is setting the benchmark for peace of mind amongst those in the used car market. Not only does the Certified Used Car Program offer a range of benefits that no private seller could offer, it comes with the backing of Australia's most trusted automotive brand, Toyota. Make sure to look for the Certified tag on the listings! ^Free 2 year CMI Secure Service Plus extended warranty is valid for all certified used vehicles and other selected used vehicles purchased on 4/9/15 & 5/9/15.